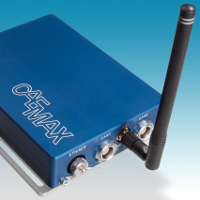 By means of the CANbox measurement data can be sent or received from one or two CAN interfaces, buffered and forwarded wireless via WLAN – e.g. to the WLAN client on your notebook. Both the CAN and the Ethernet interfaces are galvanically insulated. Even if both CAN busses are operated at maximum capacity no data will be lost. In case of any transmission failures or sync losses due to bad conditions the data is buffered automatically and sending is repeated until successfully completed. Up to 32 MByte RAM (or Flash memory) are provided as a storage buffer. As all CAN messages will be marked by a time stamp the correct sequence in time is completely secured. During system setup you may select the IDs of specific CAN messages which are to be exclusively accepted by the controller or which shall be transmitted via WLAN or LAN and which shall be stored in the CANbos until requested for further processing.